A murder investigation has been launched after a 67-year-old man died following an assault at a roadside cafe near Shrewsbury. 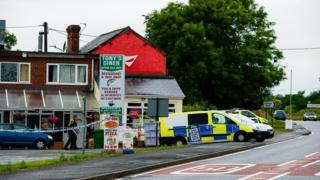 Paramedics were called to Tony's Diner on the A458 in Halfway House at 16:40 BST on Monday. The victim had suffered serious head and torso injuries, police said. A 65-year-old man has been arrested on suspicion of murder. The victim's next of kin has been informed and a post-mortem examination is to take place. Det Insp Mark Bellamy said: "At this time we are not sure what has happened and are trying to determine the man's movements over the last few days." The cafe is on the main road between Shrewsbury and Welshpool. Witnesses, or anyone who saw anything suspicious in the area, are asked to call West Mercia Police.